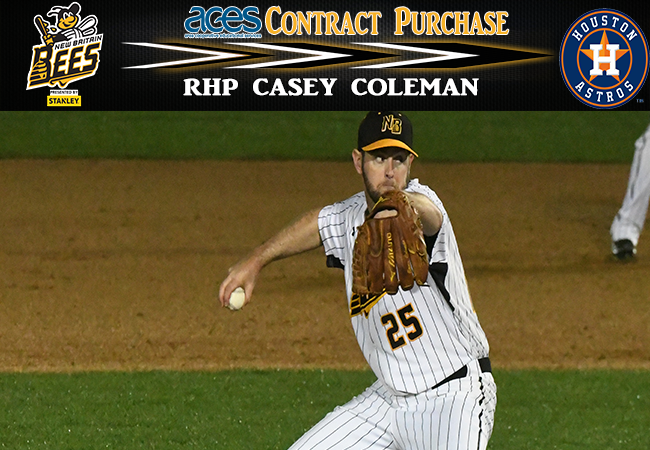 (New Britain, Conn., May 1, 2017) – New Britain Bees team officials today announced that starting pitcher Casey Coleman has had his contract purchased by the Houston Astros organization. He will report to Fresno (AAA). Coleman, 29, made two starts for New Britain, going 0-1 with a 2.61 earned run average. The Ft. Myers, Florida native was the Bees’ Opening Day starter on April 21 against the York Revolution. Originally drafted by the Tampa Bay Devil Rays in the 2005 MLB Amateur Draft, Coleman started his professional career after being drafted again by the Cubs, this time in the 15th round of the 2008 MLB Draft. The 6-foot right hander spent parts of four seasons in the Major Leagues, including three seasons with the Cubs from 2010-2012. Coleman has appeared in 58 MLB games, and has played 10 seasons of professional baseball overall, tossing 981.2 innings and with 679 career strikeouts and a career era of 4.01. Coleman’s father and grandfather, both named Joe, each played multiple seasons in Major League Baseball. Coleman is the seventh Bees player to have his contract purchased by a major league team in franchise history, and the first during the 2017 season. Coleman joins Bees alumni Shawn Haviland (Boston Red Sox - AAA), Josh Zeid (St. Louis Cardinals - AAA), Nick Greenwood (Minnesota Twins - AAA) and Josh Outman (Washington Nationals - AAA) in affiliated baseball. In a corresponding roster move, the Bees have re-signed right hander Mike Lee. Lee, a native of Las Vegas, made eight starts for New Britain last season after being acquired from the Lancaster Barnstormers, going 5-0 with a 2.45 ERA. The New Britain Bees start a four game series with Liberty Division rival Somerset tonight at 6:35 PM at New Britain Stadium. It’s Dollar Day Monday, with $1 hot dogs, chips, soda, and popcorn at every concession stand during the game. Tickets are available by calling (860) 826-BEES, online at nbbees.com, or at the New Britain Stadium Box Office.